I'm down to the last two of the pamphlets and books that Lark Publishing sent me to give away this month! 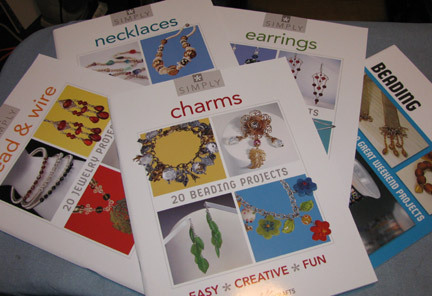 The pamphlet that is up for grabs this week is Simply Charms, which contains 20 projects that were previously published in Beading with Charms. There are lots of different themes suggested for your charm jewelry by the different artists included in the volume. A few projects show you how to actually make charms from tin, found objects, and the like, but most make use of pre-made charms. Please make sure that your link will lead me to an email address, or else I won't be able to contact you. No contact, no win, and I simply have to go on to the next person. Deadline: September 29, 2011. Sounds like an interesting book - would love to win it! Another great book I'd love to win. Thanks for posting. I'd love to win the charm book! Thanks. love the book, hoping so much to win it. I'd love to win the charm book! Posted about your giveaway on Facebook. i have always loved charms, i started collecting a charm bracelet when i was 10. Now that i like to get messy with beads and wire i would love to make my own and your book would be super! I love charms. Thank you for the giveaway! I have been playing with charms more and more. I would love to win this book. I just discovered this website, and am so glad I did! I would really love to win this book. I love charms!